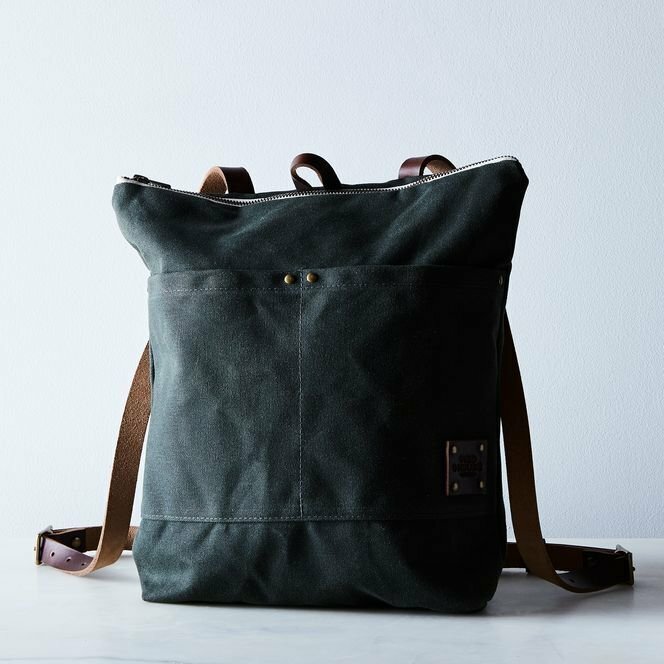 Red House's handmade waxed canvas bags have been a Shop favorite since the very beginning—and we're stoked to add these slim, minimalist backpacks to the family! All the usual clever details you love are here: the lightweight but sturdy waxed canvas shell is just the right amount of broken-in and supple, with a French ticking lining; the leather handle and adjustable straps are affixed with antique brass rivets and are sourced from Horween Leather Company, one of the oldest continuously running tanneries in the United States. The main compartment is roomy enough to fit a 13" laptop, and two exterior and one interior pocket provide plenty of room to stash your wallet, keys, and phone. Choose from a range of dreamy, muted hues—but you can only find the vintage grey at Food52. Made of: Waxed canvas shell, french ticking liner, Horween leather strap and handles, antique brass buckles, antique brass rivets, antique brass zipperSize: 12" W and 13" Tall with 3/4" W adjustable straps.